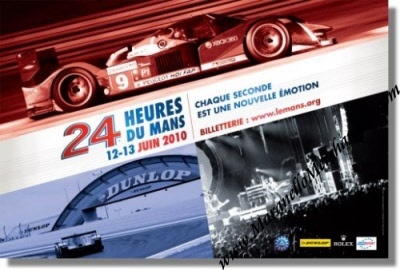 2010 24 Heures du Mans Race Poster. June 12 & 13, 2010. The poster shows a photographic impression of the action at Le Mans, both on and off track. It sports the slogan "Chaque seconde une nouvelle emotion" which translates into "Every second a new emotion". The event was won by Mike Rockenfeller, Timo Bernhard and Romain Dumas in their # 9 Audi R15 TDI Plus with a total of 397 laps to their name which constitutes a new distance record. For the full results of this race, please see 24 Heures du Mans results 2010.